Distributed from the Eastern Mediterranean to southern Siberia in the east, and from the Himalayas to the Caspian Lowlands in the north. 20 or 40 species, depending on classification, but Russian taxonomists consider there are 49 species in the FSU, 41 endemic. Most are completely unknown to horticulture. Many species have been investigated in various botanical gardens, mainly in Central Asian botanical gardens. A list is given below. From the horticulture point of view, it is very important to know the main characteristics of the species. Most important are: the height (in cm), colour of the flowers, and blooming period. These features are given below. All species mentioned occur in Central Asia, except E. altaicus (Pall.) Steven, which also occurs in the Altay mountains; E. azerbajdzhanicus Charkev., which occurs in the eastern Transcaucasus; E. spectabilis Bieb., which also occurs in southern regions of the FSU and the northern Caucasus; and E. tauricus Steven, which occurs in the Crimea. The species unknown in cultivation are marked as "New". E. aitchisonii Baker, 120-250, bright pink, April. New. E. albertii Regel, 90-120, pink-red, March-April. New. E. altaicus (Pall.) Steven, 90-150, pale yellow, May. E. ambigens Vved., 60-90, lemon-yellow, April. New. E. anisopterus (Kar. et Kir.) Regel, 35-70, white, April. New. E. azerbajdzhanicus Charkev., 100, white, May. New. E. brachystemon Vved.,60-120, pale pink, April. New. E. bucharicus Regel, 90-160, white with pink, June-July. E. candidus Vved., 200, pure white, May-June. New. E. comosus O. Fedtsch., 60-100, pale brownish, May-June. New. E. cristatus Vved., 50-80, brown-purple, April-May. New. E. fuscus (O. Fedtsch.) Vved., 100-170, green-yellow, July. New. E. hilariae Popov et Vved., 70-100, white, cream, April. E. hissaricus Vved., 120-180, dark cream, June. New. E. inderiensis (Steven) Regel, 70-100, brown-pink, May-June. New. E. kaufmannii Regel, 70-140, white-cream, June. New. E. kopetdaghensis Popov ex B. Fedtsch., 80, pink, April. New. E. korshinskyi O. Fedtsch., 100-150, brownish-golden yellow, June. New. E. lachnostegius Vved., 60, milk-white, June. New. E. lactiflorus O. Fedtsch., 70-150, milk-white with yellow, June. E. luteus Baker, 50-80, dark yellow, April. New. E. nuratavicus A. P. Khokhr., 120, brown, May. New. E. olgae Regel, 70-150, pink with yellow spot, May-August. E. parviflorus Regel, 80, white with red stripes, April. New. E. pubescens Vved., 100-150, pink-violet, May. New. E. regelii Vved., 100-200, brown purple, April-May. E. robustus Regel, 250-300, pink-white, April-May. E. roseolus Vved., 80-130, bright pink, May-June. New. E. sogdianus (Regel) Franch., 60-120, green-brown, June. New. E. spectabilis Bieb., 80-200, yellow, May-June. E. stenophyllus (Boiss. et Buhse) Bak., 80-120, golden yellow, June. E. subalbiflorus Vved., 70-100, white, April. New. E. suworowii Regel, 80-150, pale yellow, April. New. E. tadshikorum Vved., 80=120, brownish-cream, July. New. E. tauricus Steven, 120-150, white, May. New. E. tianschanicus Pazij et Vved. ex Golosk., 180, pink, July. New. E. turkestanicus Regel, 60-120, greenish yellow, May. New. E. zenaidae Vved., 100, pale pink, May. New. Most species are of great horticulture potential. They are very attractive. All have strap-like leaves in a rosette and a columnar inflorescence, a simple raceme that can reach up to 120-150 (250) cm. 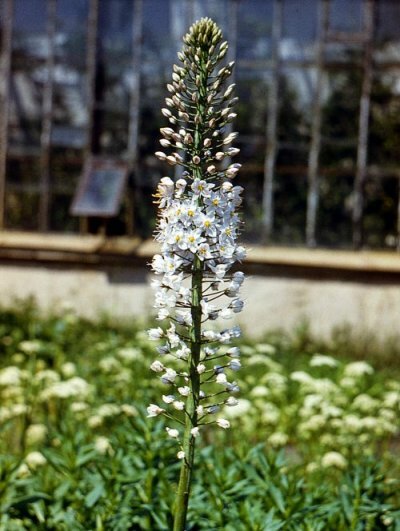 The flowers are sometimes very numerous, thus, for example, the E. aitchisonii inflorescence can contain 500 flowers, the E. candidus inflorescence may consist of 260 flowers, the E. olgae inflorescence (if fasciated) has 600 flowers and E. robustus can develop 1000 flowers in one inflorescence. Individual flowers 1.0-2.0 (3.0) cm in diameter. All species can be propagated by seed sown immediately after harvest. Some plants require 3 years before they come into flower, among them E. ambigens. Other species come into flower after 4 years. Among them are E. albertii, E. altaicus, E. bucharicus, E. fuscus, E. olgae, E. subalbiflorus and E. tadshikorum. A certain number of species can be easily propagated by division: E. hissaricus, E. pubescens, E. spectabilis, E. suworowii and E. turkestanicus. The roots, flat-spreading like a star from a small, hard crown (shortened stem), are fleshy and very brittle during the growing season. When transplanting and dividing one should be very careful. The best time for planting is late summer. For vegetative propagation each division should have roots and a part of the crown. Root cuttings without a part of the crown (stem) do not produce new buds. Vegetative propagation permits the production of flowering plants twice as fast as seed propagation. Almost all species require full sun and well-drained soil. Among the most attractive species are E. robustus and E. olgae. The first one prefers a semi shaded position and rich soil. The second, E. olgae, can grow on clayey soil and can be easily propagated. All species cannot grow in soils with excess moisture, especially in winter. Being representatives of the Central Asian region, most species are good for a warm dry climate: zones (5), 6, 7, etc. Some species can grow on dry, saline soil. They are E. inderiensis, E. kopetdaghensis, E. luteus, E. pubescens, E. roseolus and E. tadshikorum. Several very interesting ornamental hybrids can be found in nature, especially in the eastern regions of Tajikistan. Among them are: E. stenophyllus x E. olgae and E. stenophyllus x E. bucharicus. These plants have flowers of pink, salmon, orange and pink-lilac colour and a very large inflorescence.